Vigor Events will conclude the Knowledge Club™ 2018 with a 1-day Conference titled “Productivity, Engagement& Peak Performance” “PEP” on the 11th of December 2018 in Al Dorra ballroom in Hilton Resort Kuwait. In this a captivating conference, Leaders and Managers will gain valuable insights from the best-practices of progressive companies that are revolutionizing the way organizations and teams are managed nowadays leading to a rise in productivity, profits and employee engagement. The highly practical conference is designed to help attendees know the Missing Piece to Solve the Puzzle of Productivity, Engagement& Peak Performance, gain insights to the latest employee engagement trends that are affecting every business across the world, and why disengagement has become a global epidemic and also to learn new strategies that focus on successful outcomes while managing the stress of overwhelm and complexity at work. 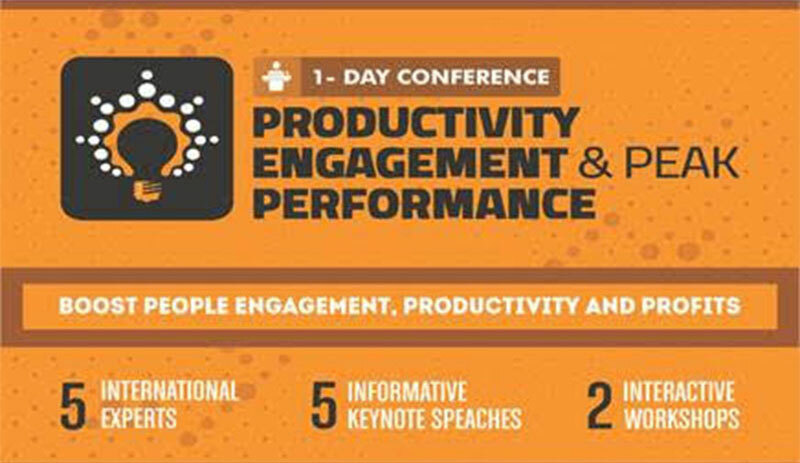 The Productivity, Engagement and Peak Performance “PEP” Conference is presenting the best-selling authors, International keynote speakers, and sought-after trainers on the subjects from around the globe such as Jason W. Womack, MED. MA. Best-selling Author of his books “Get Momentum” and “Your Best Just Got Better”, Valerie Cade, MA. Workplace Bullying Expert& Best Selling Author, David Zinger Founder of Employee Engagement Network, Ali Derisavi Management Consultant and founder of Utopia Republic Consulting Group, And Jodi Womack, MA. The CEO and Founder of Get Momentum. The conference is part of the Knowledge Club™ 2018 is the leading & development platform for top organizations in Kuwait, is attended this year by Warba Bank/ Burgan Bank as Gold Member, Commercial Bank of Kuwait/ Kuwait Oil Company/ Hadi Clinic as Corporate Members and with the media support by the International Advertising Association (IIA) – Kuwait Chapter.